Amethyst (Ovl) Pendant in Sterling Silver 2.000 Ct.
Amethyst is one of the world’s favourite non-precious gems that is adored because of its incredible beauty, specifically known for its stunning array of purple hues. It often stands alongside more expensive gemstones within jewellery like diamonds, sapphires and emeralds, showing that it is just as valuable and extremely sought after. When it comes to the real origins of amethyst, Greece was indeed the civilisation credited with first discovering the stone. 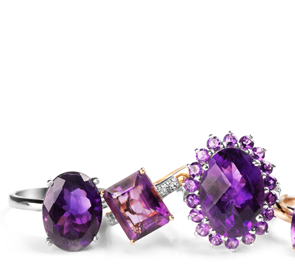 However, the finest amethyst were found in Russia and were featured in much royal European jewellery. It was once thought that the stone would help to protect people from becoming drunk and suffering hangovers, perhaps why it was linked to the god of wine and excess. As a result, it was common for the ancient Greeks to drink out of cups made from amethyst in an attempt to stave off the effects of wine. It is also believed to keep the wearer clear headed and quick-witted! Amethyst is a member of the quartz family that has a quite a good level of hardness (it measures 7 on the Mohs scale), which means it is a durable stone and so is well-suited for use in most types of jewellery. While you can find amethyst in large quantities in a huge number of places across the globe, it is very rare to get good size stones that are a uniform dark colour. This means that deep amethyst is the most coveted. Admired as February’s birthstone, this brilliant gem is perfect for styling throughout the year – so indulge in a range of beautiful amethyst jewellery including Amethyst Earrings, Amethyst necklaces and Amethyst rings.